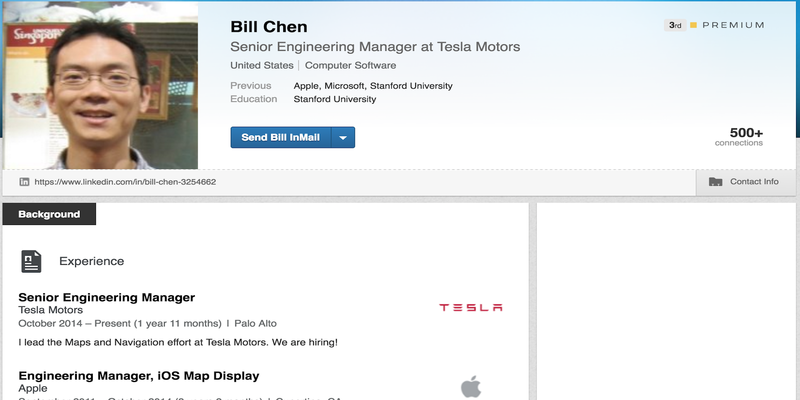 According to a report from the Information, and confirmed by Tesla, Maps/Navigation Senior Engineering Manager Bill Chen has departed from the company. The report didn’t discuss the terms of the departure nor which party instigated the termination, but Mr. Chen’s department was under increasing pressure to develop its own Maps software including its Autopilot-focussed high precision maps. Tesla’s system relies heavily on GPS data and its custom high precision maps. The system can, of course, still work from live data, but the ride is rougher. Depending on the car’s GPS position, Tesla’s Autopilot downloads new high precision map tiles of the area based on data collected from the fleet. Chen’s Linkedin Profile hasn’t yet been updated. Chen came to Tesla 2 years ago from Apple where he spent over 4 years working on developing the iPhone maker’s Maps effort. Prior to Apple Chen spent 4 years with Microsoft Research after getting his Ph.d from Stanford in 2005.